This resort has 8.48 acres with sand and gravel base and a small sand beach, southeast exposure. Starting with main lodge you have a games room if so desired, a dining room that will seat 28 guests. A new kitchen will serve an American Plan. The owners apartment is also attached with the lodge. A total of 2200 sq. ft. A newly constructed covered porch will keep the weather off you during those rainy days and nights. To bring it all together there is a spacious lounge and a pool area. A total of seven cabins, one being a frame unit, the rest are of natural log construction. All of theses have private baths, porches, private docks, covered decks and housekeeping facilities. Well maintained. A fish cleaning unit, garage/workshop, generator shed & a staff cabin completes this property. An ideal location and private setting is sure to please! The equipment is well maintained and the income is reasonable. 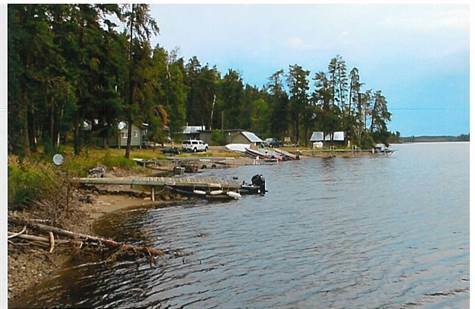 Access to numerous quality fishing lakes with scenic beauty, waterfalls & natural wonders.